It’s long been one of his favourite venues, and today Christian Ahlmann had his home crowd in the palm of his hand once again, taking the top spot. Belgium’s Francois Mathy Jr (Uno de la Roque) and Italy’s Lorenzo de Luca (Armitages Boy) produced the only other double-clears to finish second and third. In the weekend's FEI Driving World Cup™ in Leipzig, Australia’s Boyd Exell clinched another win. Bram Chardon of the Netherlands took second place and Jérôme Voutaz of Switzerland finished third in Sunday’s event, which packed in the crowds at the Leipzig Messe. Ahlmann’s compatriot, Daniel Deusser, posted the quickest round against the clock with Tobago, but had to settle for fourth with an unlucky fence down. Ahlmann has an impressive record at Leipzig. 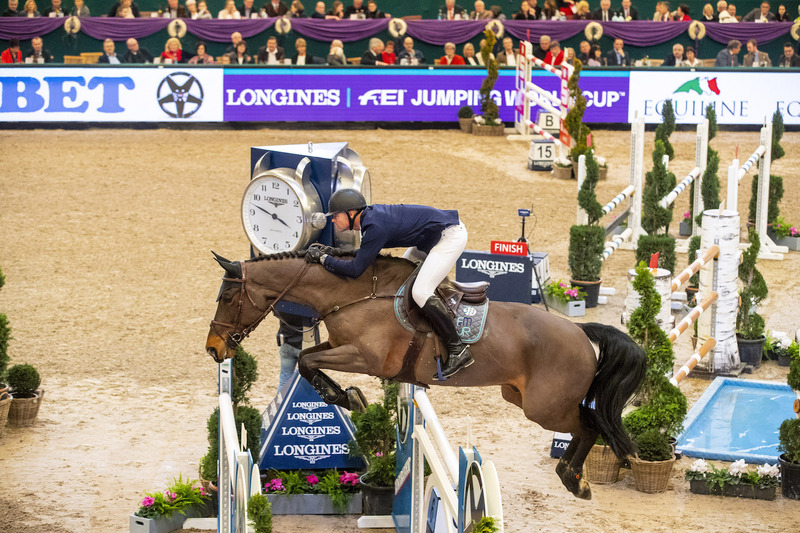 The Netherlands’ Leopold van Asten and VDL Groep Beauty led the way with a fence down in 40.83 seconds, and when Germany’s Tobias Meyer tried a very tight inside turn to the third he paid the price when Queentina slammed on the brakes. Third to go however, Mathy Jr set a strong target when breaking the beam with a clean round in 41.49 seconds. Deusser crossed the line in 39.53 seconds but left the same fence as van Asten, the planks at fence five, on the floor and although de Luca was foot-perfect, his time of 42.19 left Mathy still out in front with just two left to go. The crowd gasped when home hero and three-time Longines FEI Jumping World Cup™ champion Marcus Ehning kicked out the first before steaming around the rest of the track with the fearless Comme Il Faut, so Ahlmann knew exactly what he had to do, and Caribis Z made it look very easy when cruising through the finish in the winning time of 40.70 seconds to a massive roar of approval from the packed stadium. It was a spectacular finale to the season’s FEI Driving World Cup™ qualifying events, as Exell clinched another win at Leipzig this weekend. Dr. Wolfgang Asendorf’s straightforward but tight 740-metre course got the better of a few drivers. Three-time World Cup champion Ijsbrand Chardon of the Netherlands had to reverse his horses after having two early penalty balls down, which ate up the clock for him for a total time of 187.16. American Chester Weber had a clean round but with a time of 150.90 narrowly missed the drive off, as did Dutchman Koos De Ronde, who finished in 149.87. Competing first in the drive off, Bram Chardon avoided penalties and finished in 126.97 seconds for a total time of 276.40, a tough score to beat. Exell flew through the course, and it looked at first like his boldness might have been a bit too much, as he picked up 8 early penalty points. But with speed as his forte, the Australian driver pushed on, and finished in a lightning time of 122.78 for a total score of 275.36 and another win. Only six driving teams will go on to participate in the FEI Driving World Cup™ Finals in Bordeaux next month. In addition to Exell, Bram Chardon, and Voutaz, Koos De Ronde, Ijsbrand Chardon, and Glenn Geerts of Belgium will be competing for this prestigious indoor Driving title. Save February 7th through the 10th on the calendar and tune in to FEI TV to see who will take home the gold!